1/48 scale Hawker Sea Fury FB.11, 805 Sqn Fleet Air Arm, Royal Australian Navy, Auster Incident - 30 August 1955. Waterslide decals (two partial sheets) for two subjects including 10 pages of instructions and notes; two small resin parts. 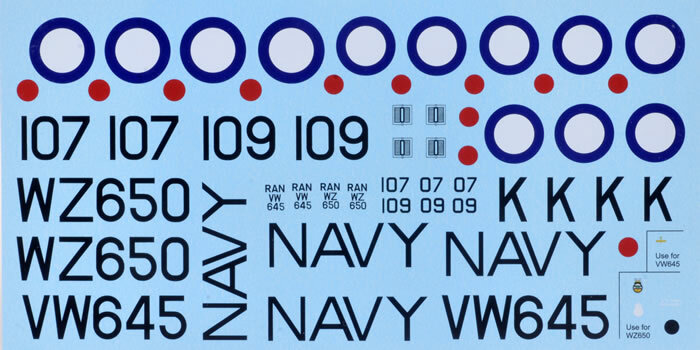 High quality decals; full markings (including roundels) to complete both aircraft; detailed history; includes resin camera fairings and stencil decals. A high quality decal release and a great back story. Highly Recommended. 30 August 1955 saw a remarkable series of events in the skies over Sydney. At Bankstown Airport, a pilot was practicing circuits when his Auster J-4 Archer's engine stopped just as he was landing. He touched down safely and exited the cockpit, swinging the propeller to restart when the aircraft started rolling down the runway. Despite the pilot's efforts, the Auster took off unmanned, lazily gaining height and circling the airport before drifting towards the city. With fears that the Auster might crash into the densely populated inner or Eastern suburbs of Sydney, a nearby Auster Autocar was asked to shadow the runaway plane. The Autocar pilot confirmed that the Auster was unmanned. Two RAAF Sabres, one flown by WWII ace Dicky Cresswell, entered the fray at this stage but as they were unarmed they could do nothing more. 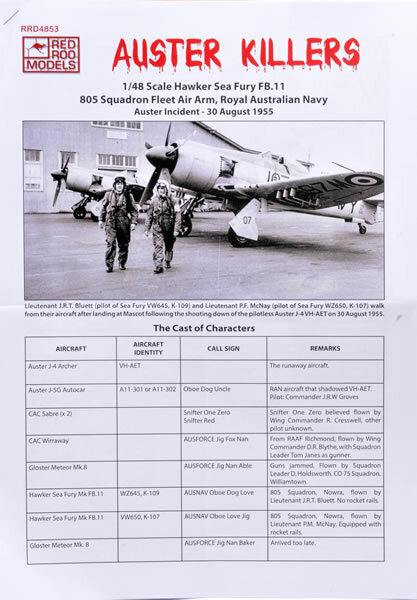 A Wirraway trainer was therefore called upon to shoot down the Auster using a hand-held Bren gun in the rear cockpit. Two firing passes were unsuccessful and as the Auster was now flying at 9,500 feet and after a single unsuccessful pass, the gunners hands froze and he was unable to reload the Bren Gun. Now an RAAF Meteor was called in to help. This was a successful interception but after ten rounds hit the wings of the Auster, the Meteor's guns jammed! Finally, just over two hours after the unmanned Auster took off, two RAN Sea Furies contacted Sydney ATC and announced that they were armed and would shoot down the runaway. The Auster was finally shot down and crashed into the sea at 11:42 am. 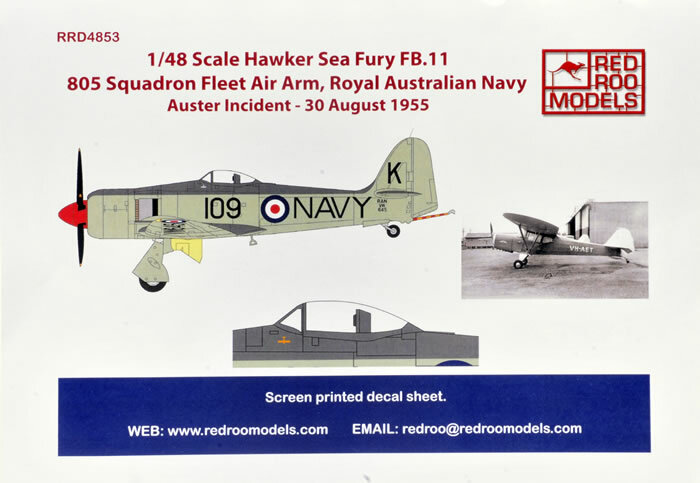 Red Roo Models has released a decal set with markings for both RAN Sea Furies involved in the Auster shoot-down on 30 August 1955. The serials, codes and national markings are included on the larger of the two sheets, while stencils are supplied on a second smaller sheet. An Auster kill mark is also offered if you want to depict VW645 after the incident. 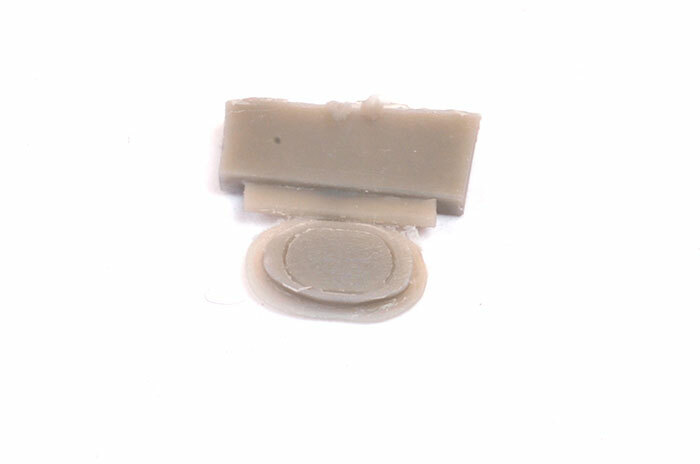 Two small resin parts are also included. This represents the port and starboard side oblique camera ports. The vertical camera port on the bottom of the aircraft is represented by a decal. Instructions and history are covered in a comprehensively detailed ten-page document. These are a real highlight. This is a simple but very interesting release from Red Roo Models. What the RAN Sea Fury may lack in marking variety is certainly made up for by the back story of these two Auster Killers!